RALEIGH – For all the redevelopment activity that has taken place in Raleigh in recent years, the city’s downtown skyline has remained relatively unchanged outside of a few notable additions. On Tuesday, the Raleigh City Council will consider a rezoning request that could transform downtown’s warehouse district and, if approved, usher in a new phase of high-density development outside of the Fayetteville Street corridor. Raleigh-based Kane Realty is seeking to redevelop 2.5 acres between south West Street and south Harrington Street and construct what would be easily the tallest building in the district. Kane Realty wants to build an 18-story office tower on the southern end of the property currently occupied by a two-story Dillon Supply warehouse. John Kane, the company’s CEO, said he hopes to preserve as much of the 67,000-square-foot warehouse as possible. While Kane’s proposal has supporters, it faces an uphill battle to gain approval. Three of Raleigh’s eight council members plan to recuse themselves from voting on the plan due to their relationships with Kane Realty, so each of the remaining five members must support the proposal in order for it to move forward. Bonner Gaylord is employed by Kane Realty as its general manager for North Hills. Wayne Maiorano works for a law firm, Smith Anderson, that contracts with Kane Realty. Russ Stephenson has unrelated contractual relationships with Kane Realty, he said. That leaves Mayor Nancy McFarlane, Mary-Ann Baldwin, John Odom, Eugene Weeks and Kay Crowder to consider the proposal. A vote on the project could take place Tuesday. While Baldwin, McFarlane, Odom and Weeks say they are generally supportive, Crowder said she wishes renderings of the residential building looked more industrial. “I’m not sure the residential part is at a place where I could support it at this time,” Crowder said. On the northern end of the property, adjacent to the new Citrix headquarters that is also a former Dillon Supply warehouse, Kane wants to build apartments that would be between five and seven stories tall. Plans for each tower call for retail on the bottom floor, and the office building would include a seven-story parking deck, Kane said. The warehouse district – roughly bordered by Hillsborough Street to the north, Dawson Street to the east, Cabarrus Street to the south and the Boylan Heights neighborhood to the west – lacked retail activity until recent years and is still “crying out for residential,” Kane said. He thinks his project would complement new and forthcoming additions to the area, including the Citrix building and the $80 million Union Station transit hub that is expected to open in 2017 at 501 Martin St., one block from Kane’s site. Kane said the office tower should appeal to tech companies like Citrix and Red Hat, which he’s heard will soon outgrow their downtown buildings. 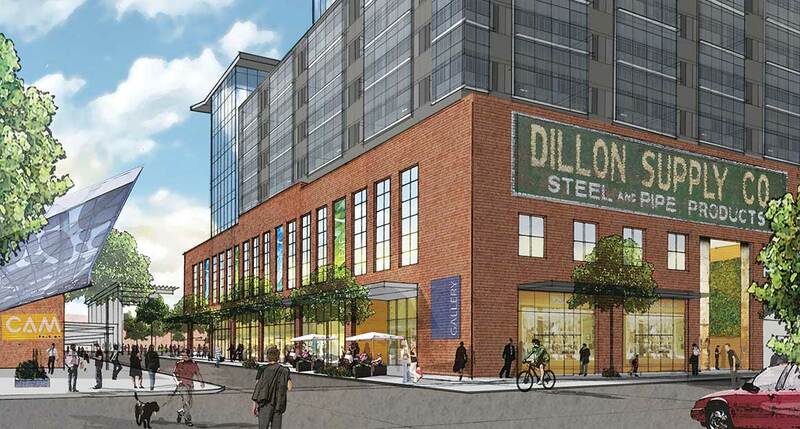 The Dillon project marks the first major request from a developer to build a tower in the district, but observers don’t expect it to be the last. As land prices rise across downtown, developers are expected to seek to construct taller buildings in an effort to make their projects profitable. The city should embrace such density in the district – not just the Fayetteville Street corridor, said Greg Hatem, owner of Empire Properties, which owns dozes of buildings downtown. “I don’t know anybody that’s worked that hard to create a sensitive plan for that area,” he said. Raleigh’s Planning Commission unanimously recommended the council approve the project. Others view it as the natural evolution of the district. Andrew Leager, owner of the Boylan Bridge Brewpub, where patrons can sit on a Boylan Avenue patio and look across the warehouse district to the Raleigh skyline, likes Kane’s plan. Mayor McFarlane said the project has the potential to be “an anchor” for the district. Crowder was also the only council member to express mild concern about the commercial building’s height. But she said her reservations were tempered by her excitement about the commercial building’s Durham-based architect, Duda Paine. Kane’s rezoning request is being watched closely by both city officials and other developers eying downtown land for high-density projects. Kane’s purchase of the property from Dillon Supply is contingent on getting it rezoned. Councilwoman Baldwin said the city invested $18 million in Union Station in part to encourage projects like Kane’s.